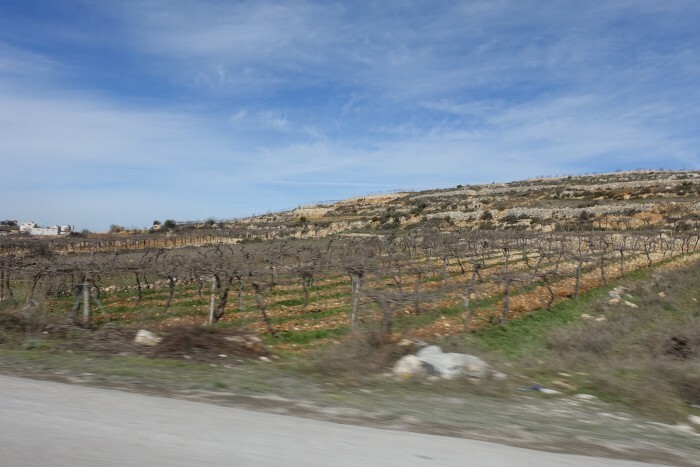 Table grapes from a vineyard near Hebron. I shot this from a car. Who knows what ancient varieties may be there? If you are a fan of unusual grape varieties, the Israeli winery Recanati has a couple of wines for you. Their story is, literally, epic: centuries spent in hiding until Israeli-Palestinian cooperation brought them back. The ancient white wine has been available for four years; the ancient red is just coming on the market this year. Marawi and Bittuni are ancient grapes that disappeared from wine production during the centuries that Israel was ruled by Muslims. Wine was important in the Biblical era, and there is plenty of archeological evidence of wine production in the Holy Land. But in the modern era, until Edmond Rothschild restarted wine production in the 1880s, the area was a viticultural desert. Rothschild brought the best-regarded French grapes at the time, including Cabernet Sauvignon and Merlot, and the Jewish community made generally lousy wines with them for decades, before and after the founding of the state of Israel. Cab and Merlot aren't well-suited for the Mediterranean heat of the low-lying areas where they were planted. Israeli wine has been on a resurgence for about two decades, led mainly by growers planting in higher-elevation, cooler areas. (Complicating things, many of these areas are in Palestinian territory.) Everyone understood that Cabernet Sauvignon and Merlot, which are believed to have originated in the 1700s in France from natural crossings in vineyards, were not the grapes of the Bible. Most people just assumed that the grapes behind sage advice like "Use a little wine for thy stomach's sake and thine often infirmities" (1 Timothy 5:23) were lost to time. Dr. Shivi Drori at Ariel University thought he knew how to find them. What is Jimmy Butler drinking to celebrate the Minnesota Timberwolves making the playoffs? I love that he's specific. Not just "wine," or "good wine." Butler knew exactly the bottle he was going to open. For those of you not following the NBA, Minnesota had not made the playoffs since 2004, the longest stretch of no-postseason play in a league where more than half the teams make the playoffs. The Wolves faced Denver on Wednesday in the final game of the regular season, with the winner going to the playoffs and the loser staying home. The Wolves won in overtime. Congratulations Minnesota! You earned that fine bottle of wine. If you want to enjoy the same wine as Butler, you can buy it here. It's not cheap, but neither are NBA playoff tickets.